The worship theme at my congregation this month is Practice. I struggle with practice, as I have mentioned maybe once or twice before. I struggle with routine. Aside from brushing my teeth and having my morning tea, it’s hard for me to point to anything I do in my life in a consistent way. I’ve tried prayer, meditation, journaling, meditation, yoga, meditation… I think my longest run with one daily spiritual practice was three months, tops. Recently a friend of mine* went on a ten-day silent Vipassana meditation retreat, and returned feeling deeply transformed by this practice. He lights up as he talks about what he has learned, and has maintained a regular meditation practice of at least an hour a day since he went. He wants me, and everyone else, to experience the deep satisfaction he gets from feeling more grounded, balanced, and in tune with his own body and emotions through this daily practice. The Vipassana Center in Massachusetts has no current openings for women in any of their upcoming ten-day retreats. Once I know when my son leaves for college, I will probably add my name to a wait list. Until then, I am cursed to be my regular, struggling self, envious of his spiritual epiphany and regular practice. Maybe. Or maybe I’m as blessed as I ever was, and ever will be, and my path will look different from anyone else’s. Different than his. 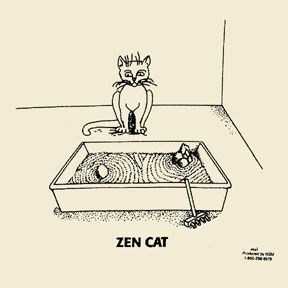 My enlightened, dear friend is still human, as he demonstrated when he said to me, with some evident frustration, that we all have the same number of hours in the day and we make choices – whether to spend an hour in silent meditation, or to spend it cleaning cat litter. Shots fired! He said this knowing I was heading to pick up a fourth cat from a humane society in Maine the next day. I did not push him off the path we were walking on, though I was sorely tempted. I think I may have spluttered out loud. He did apologize a few minutes later, realizing it might not have been spoken with exactly the compassion he is trying to live with every breath. And cleaning the cat litter is daily. More than daily, now. I’ve always admired the Muslim commitment to stopping for prayer five times a day, and I’m trying to keep my cat litter super clean now. Part of this is because Kit Kat has a history of litter avoidance and problematic elimination. But part of it is embracing it as a spiritual practice, and changing it from an icky chore to a contemplative appreciation of my feline companions. Who help ground me, who lead me into silence and stillness and a focus on purring and breath. The dogs call me outward, to walk on the earth and sniff the ground and notice the squirrels and birds and the changing weather. These animals help my spirit feel whole and balanced, and my care for them can be mindfully offered. I do hope to get to the Vipassana Meditation Center to experience a retreat for myself. But in the meantime, I’m going to be practicing as I clean that cat litter and walk the dogs. Keep breathing in and out, y’all. Have a glass of water. Life is good. *Some of you – okay, a lot of you – will be able to guess who this is. Don’t worry. He saw this before you did, and this is posted with his permission. I have seen that before, but it is funnier now!